Shopping for males was something that was taken care of by their female counterparts and not something that was given a lot of thought. Aided by modern retail, the male shopper is now more open to shopping for themselves. Though they may not be more of the impulse buyer, their contribution to retail sales is pretty significant. A man’s shopping threshold is one tenth as compared to that of a woman’s. Though this clearly points towards their level of patience when it comes to shopping, it may not reveal their entire story. Men are the big spenders not women. Retail sale of big ticket items either offline or online is ruled by men. Either directly or indirectly, the final say on the purchase is theirs. Online, sales above Rs 1 lakh are only made by men and if we move a little lower on the cash spends, 75 per cent of men spend between Rs 10,000-Rs 30,000. Men’s per capita annual spend on designer clothing is about Rs 48,000. 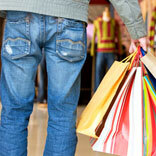 Men also enjoy shopping as much as women; what is different is their shopping preference. 46 per cent male buyers prefer shopping at exclusive brand stores. Price does have due significance but the time consumption for a transaction is what they are more concerned about. With respect to newer products and brands, 31 per cent of the male species are willing to experiment and 28 per cent would switch for newer brands owing to special offers and promotions. Men are usually focused buyers and would go straight where they wish to purchase what’s on their mind. 48 per cent men move on these lines. Attractive packaging is not something that would draw them to make the purchase, rather handy and easy to carry merchandise is what they pick up. While new collections attract women, a good deal is what would bring a male shopper to a store. At eBay, over 70 per cent of their consumer base is men. According to Kashyap Vadapalli, Chief Marketing Office, eBay India, their core target audience is primarily male, ages 18-34. Retailers are increasingly evaluating and understanding their male clientele. To cater to their needs in a better way and bridging the missing gap, they are devising strategies to improve a male shopper’s retail experience. Further realising the industry potential, they are augmenting space in stores making way for more men related articles to be bought off these shelves. Considering everything they must keep in mind that men are harder to please as customers. Across retail, the need to cater to men is on the rise. Ranging from skin whitening creams to jewellery to footwear, they are getting mounting substance. Men’s footwear industry is pegged at $ 1.04 billion and has to its share the largest piece of the footwear industry. With 52 per cent share, it is 30 per cent more than the share of women’s footwear and double of that for kids. The men’s grooming market has seen a big bang and is growing the fastest. Owning to the growing interest in personal grooming, visits to salons and spa’s by men is also on a rise. Nilanjan Mukherjee, Head of Marketing, Personal Care Products Business, ITC Limited, says, “In an evolving trend in India, men are beginning to look at value propositions created specifically for them. ITC’s Personal Care Business has succeeded in attracting consumer mind space through consumer-insight based product innovation.” ITC has launched a website dedicated specially to men to engage and capture this market. Diamonds which are said to be a girl’s best friend is also turning heads towards the men’s market. Jewellery as a sector is also witnessing intrusion of collections designed for the male shoppers. The biggies are giving this segment serious thought. CaratLane’s customers include a large number of men seeking to buy engagement solitaires or loose diamonds that will not only be set in custom-made designs but also as good investments. Men also enjoy retail therapy as much as women and indulge in it but with a considerable level of convenience. That is the only difference that shopping actually holds between men and women. Men love to shop but not to show it.